And now, todays food: An Indian spiced tomato sauce with eggs. Seriously, this is good! There's this spice mix called "Panch Phoron" or "Panch Phoran" or whatever...apparently there's not one way to spell it. Anyway, however it's spelled, it's very very tasty. It's a mix of equal parts of cumin seeds, nigella, fennugreek, fennel seeds and black mustard seeds. This combination is really special and aromatic. I don't use it very often, but every time I do, I always think I should use it more. It's really that good. Hard boiled eggs, as much as you like. I used 5 for 2 people. The sauce is enough for about 8 eggs. In a blender, combine tomatoes, ginger, garlic and onion. Blend until it's a smooth paste. In a pan, heat about 1 tbsp of fat. When hot (a little smoky), put in the panch phoron and stir immediately, turning the heat to low. Stir for 10-20 seconds and be careful not to burn the spice mix. Pour in the tomato mix and stir wel. Add the salt, coriander and turmeric and mix well. Simmer on low heat for about fifteen minutes to reduce the sauce a little. 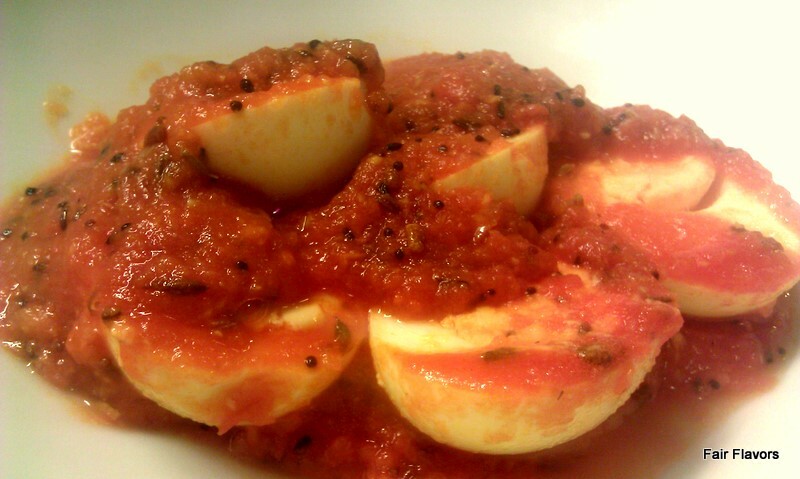 Cut the eggs lengthwise in half and place them carefully in the sauce. Let them simmer in the sauce for about five to ten more minutes until they're warmed through and have taken on some of the sauce. We served this with cauliflower rice. Enjoy! Maybe, if you're highly allergic to all forms of dairy, you shouldn't use it. I had absolutely no problems using ghee.